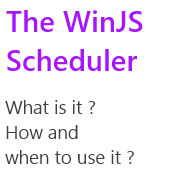 Windows 8.1 comes with a new feature in the WinJS SDK : a scheduler. Let’s see what it is and how to use it! In Windows 8, every job is nearly done as soon as you execute it. You could play with the msSetImmediate function but it was still a little mode “hack” than “code”. 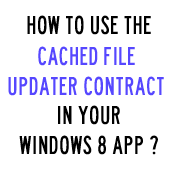 With Windows 8.1, the SDK introduce a scheduler used by the whole WinJS framework. This scheduler helps you to define what is important (animations, visual feedback, manage user input) from what can be delayed (background work, data processing not used immediatly). The goal is to let you build application which reacts immedialty to the user will. WinJS : use the same data in the zoomed out and zoomed in view. The Semantic zoom let you display your data in a zoomed out and zoomed in way. It’s really fine when your data is grouped but sometimes you need to display a non-grouped data just in a different way with a different template. This is exactly the same data but shown in a different fashion. The user choose the one it prefers. 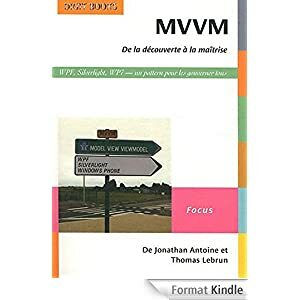 But, if you try to set the same data source to the both listview in your semantic zoom, your app will crash.